Traditional Robinson's corner house that was very busy on my Saturday lunchtime visit. Most people were finishing off meals. But there were plenty of people just there for the ales. A unique feature here is a snug, which you have to walk through the bar area itself to get to. Initially I thought there was just a huge number of bar staff, until I realised that some of the people wandering behind the bar were actually punters. The pub only stocks Robinson's ales. They had Unicorn, Wizard, Dizzy Blonde, Trooper & Light Brigade. Most of these were fairly pale ales. I opted for the Wizard. A bit out of the centre. But worth finding. Quite a contrast to the other Robinsons pub we tried on our Stockport crawl (Bakers Vaults). This is a very traditional old school boozer and probably retains pretty much the original layout, woodwork and glass. The hand pumps are hidden at the back of the bar, if I remember rightly there were 6 in total, 3 on each side. All were Robinsons ales I think. We went for a pint of Hopalulu, a 4.6% blonde, which was fine, though I think I was expecting more hoppiness! I would be happy to pay another visit. Fantastic food and good range of robinson beers. 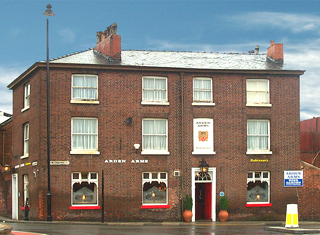 A hidden gem in this great town of Stockport with all its great pubs. I would honestly say this is the best place to eat in stockport town centre and the beer is good too. 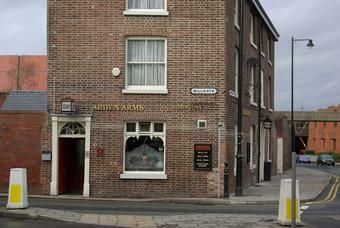 A very traditional robinsons pub well worth a visit. More of a restaraunt than a pub. It's a real pity. This used to be a great place.